I've had a ridiculously lovely weekend! I was down in London for work last week, and managed to time it pretty perfectly so that I could spend Saturday & Sunday with my lovely friend Steph who lives down there (and who I miss very much!). I don't make it down to the capital as much as I'd like to, so I made sure to use a little of my free time to make a trip to Wah nails! It felt like I pretty much had to get my nails done as it was around this time last year that I popped into Wah (very spur of the moment), had candy stripes painted & then got obsessed with nail art! 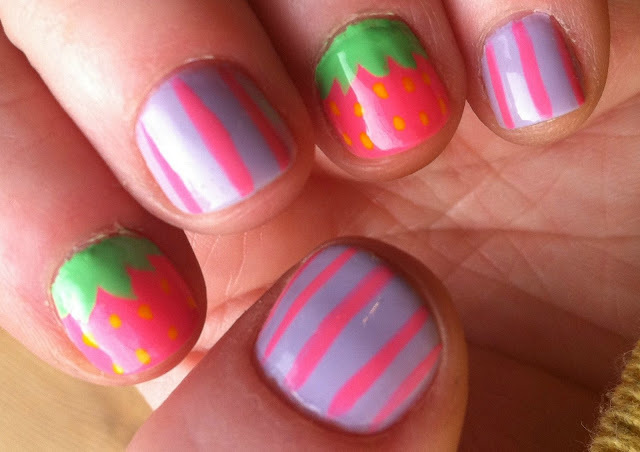 I went for a very Spring-like mix of strawberries and pastel stripes and I love love love them! They've lasted for days too - I still don't have any chips! I wish I could get my nails painted every week (although it would be quite an expensive habit!). I'm just starting to get into nail art after seeing The Dainty Squid & Elycia's zig zag nail art. 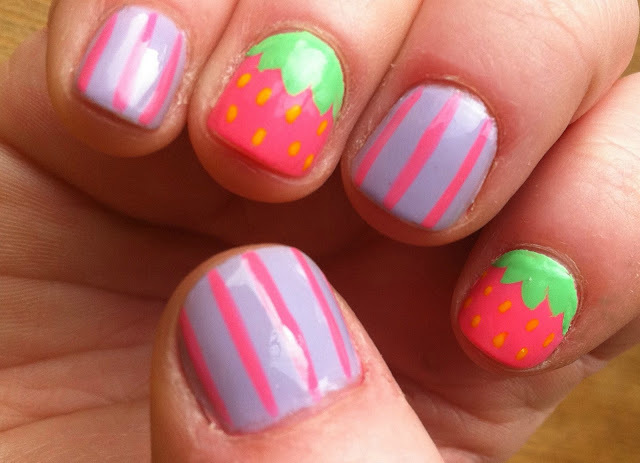 I love the strawberries! I saw last year on a nail art blog post that someone had done their nails like the teenage mutant ninja turtles! I was beyond impressed! They look mega cute! Love em. I love those nails! I want them I want them I want them!